Weather is one of the key factors that determines why and how the leaves turn color in the Fall. 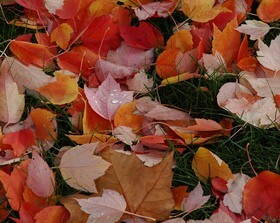 A small change in the weather can easily affect how colorful the leaves will be. Things such as the amount of moisture in the soil, temperature, and even the length of the days affect what colors the leaves will eventually turn — and even the brightness and hue of those colors. Autumn colors happen as a result of longer nights and less daylight — which affects the production of chlorophyll, the ingredient that keeps plants green during the growing season. When the nights become longer and there is less daylight, the production of chlorophyll slows down and finally stops all together. When there is no more chlorophyll, then all that is left are carotenoids — which are responsible for the yellow, orange and brown leaves and anthocyanins which are responsible for the red, blue and purple colors in leaves that are sometimes seen with such trees as dogwoods. Scientists have discovered that when days are warm in autumn, and the nights are crisp and cold, this is when fall foliage is most vibrant. However, when the nights stay warm as they have recently because of global warming, they have noticed that the fall foliage isn’t as brightly colored. Soil moisture can also affect how colorful the Fall foliage is. As an example, if there is a drought in either late spring or during the summer, this can actually move the fall season up a few weeks, which can mean less vibrant fall colored foliage. An early cold snap can cause problems too. If, for some reason, instead of a gradual cooling with autumn as is the norm in most places, you instead have freezing cold temperatures this could cause foliage, particularly those trees and plants with tender leaves which tend to drop those leaves early in order to protect the plant or tree. Broad leaves tend to be thin and tender, and the fluid in their cells is also thin. Cold weather can freeze that fluid killing the leaves and possibly causing damage to the plant. If the tree or plant drops the leaves either before Fall really hits, or just after the leaves begin turning, the amount of colorful Fall foliage can be less and for a shorter period of time. I have always loved the Fall season. The colors here in Washington were quite vibrant last year due to the temperate days and cooler nights. However, this Fall they seem a little less colorful than previous years — probably due to the fact that the evenings are still quite warm even now in mid-October. As you can see, weather does play a crucial part in how colorful the Fall foliage is. The slightest changes in temperature, moisture in the soil, or even the length of the previous season can all affect Fall colors. With global warming on the rise, there is no telling what our future Fall seasons are going to look like. Is Climate Change Dulling Fall Foliage?